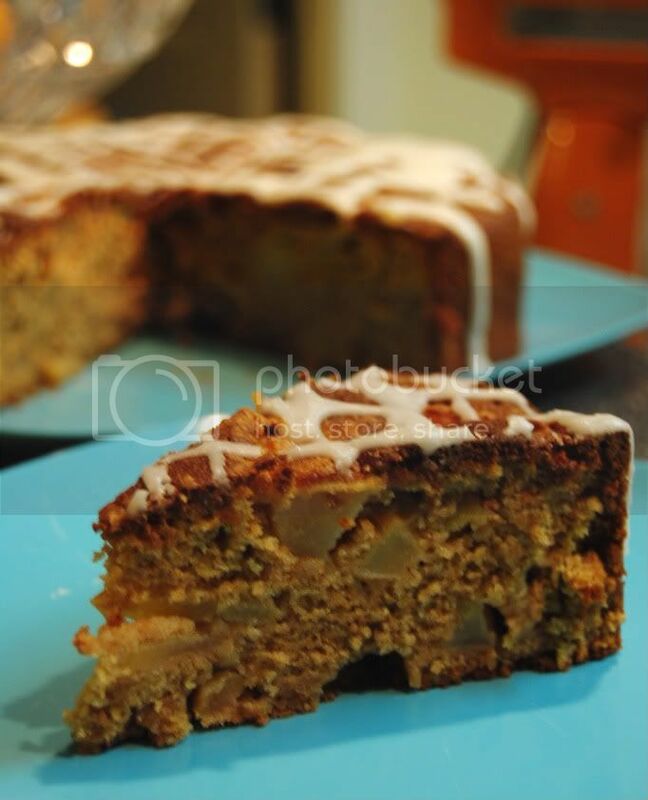 Today I took a break from exam studying to bake an apple cake! Which I'd been meaning to do for a while now. Not to mention it tasted like autumn in cake form. A few weeks ago, a group of friends and I went up to Carter Mountain Orchard to pick apples, and I picked a fair amount of Winesaps to use for baking. Finally put them to good use! 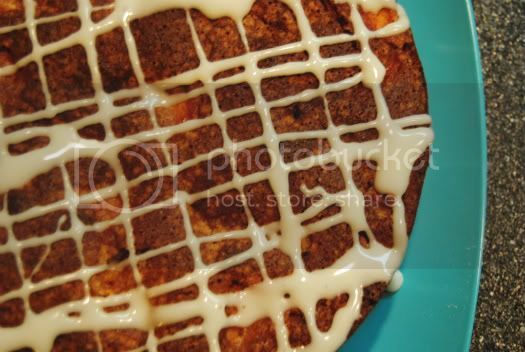 I found a wonderful recipe at soupbelly for an apple cake with lemon glaze [although, I ended up making a lime glaze because we only had lime juice on hand, but I'm sure the lemon would have given it an extra kick]. Preheat oven to 350 degrees Fahrenheit and grease a 9-inch springform pan. 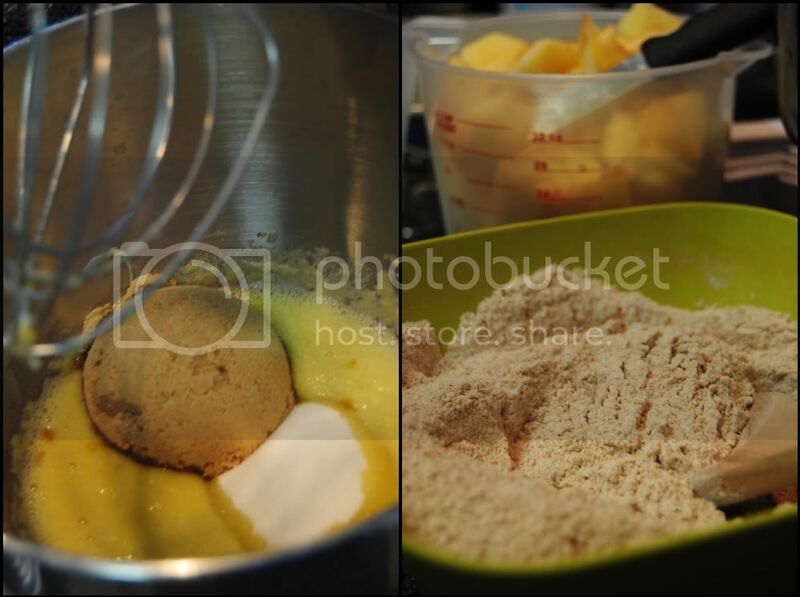 In the bowl of an electric mixer, whisk together eggs and oil [or applesauce if using substitution]. Add granulated and brown sugars and vanilla and whisk until blended. In a separate bowl, combine flour, baking soda, salt, cinnamon, and nutmeg. Add flour mixture to egg and sugar mixture and fold until incorporated. Batter will be relatively thick. Fold in apples. 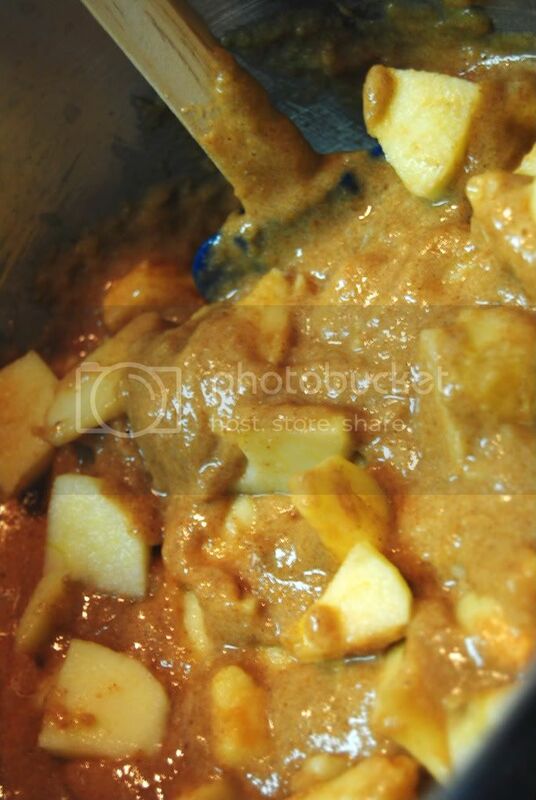 Pour batter into pan and level it evenly. Bake for 70-75 minutes. Let cool completely before pouring glaze on top. To make glaze, sift confectioner's sugar. Pour in lemon juice and mix until sugar has dissolved. Add more lemon juice for thinner glaze; add more confectioner's sugar for thicker glaze. 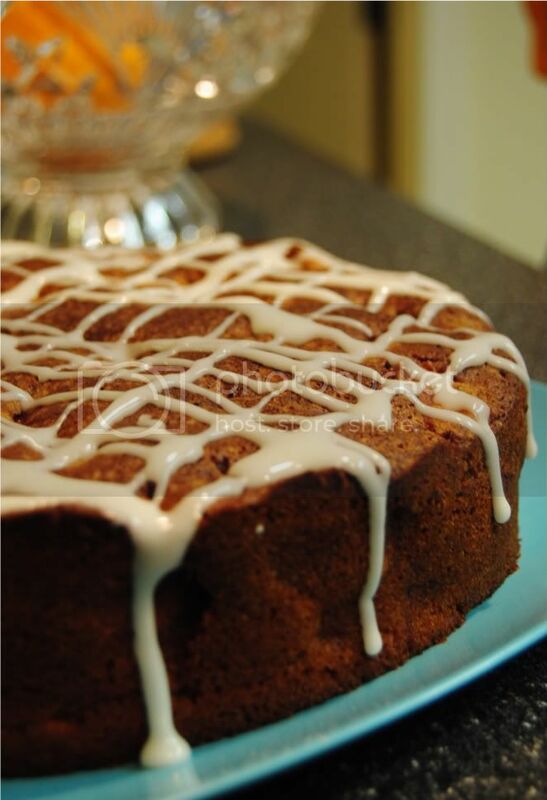 Once cake has completely cooled, use a spoon to drizzle glaze over top. I let the cake cool while I went to take my exam, and I had actually forgotten about it until I walked in and smelled the cinnamon and apple. Talk about a pleasant surprise! Made the glaze and drizzled it before I had dinner, then cut a slice for Noosh and myself. Yum. And not even that bad for you! Whole wheat flour, applesauce instead of oil; it's practically a health food, really. In other news, I can't believe it's almost Thanksgiving. Which is, incidentally, my favorite holiday. Well, I like the entire current holiday season. But Thanksgiving is in a league of its own, with all its gastronomic prowess. And mom gave me the 'honor' of cooking our entire Thanksgiving dinner, meaning she's either giving me a false sense of culinary self-worth before telling me she already has dinner planned out, or she plans on watching me make a fool out of myself in the kitchen. I'll probably destroy the turkey/light something on fire and run to her for advice/grovel at her feet for help, but until then, the thought of cooking dinner is keeping me happy. Plus, it'll be nice to be home for a bit. Cake looks deeeelicious.Save a slice for me.Btw while you're home this weekend can you bake the coffee cake for Baba and the christmas biscotti for me.I need to put on some weight a patient just told me! What sort of apples should we use? 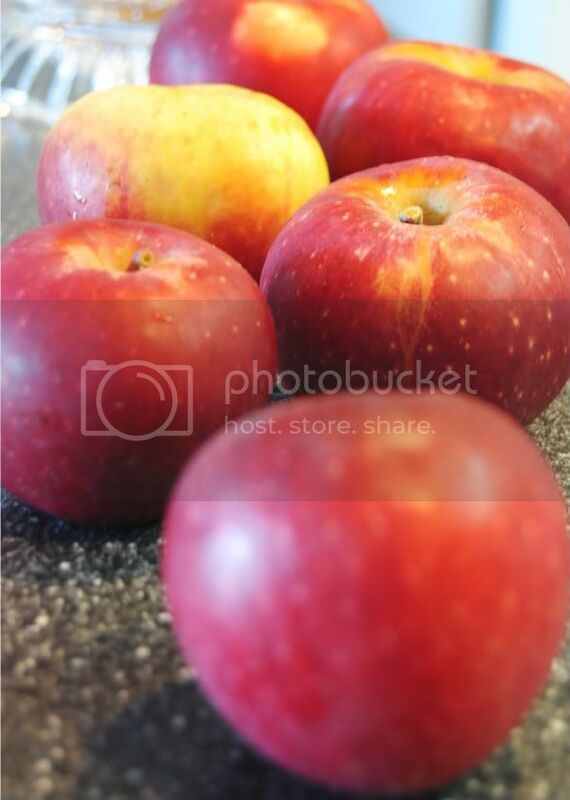 I've bought plenty of red gala apples, would that be alright? :) thanks!